WineRelease.com's May 15, 2009 Monthly Newsletter. Greetings from WineRelease.com, now 1,326 winery listings strong! And greetings from Madrid as my wife and I begin our two year stay here in the middle of Spain. We found a great apartment in the Salamanca region of Madrid complete with a butcher, fish monger and three tapas bars within a block. The food has been great. Tomatoes with tuna, Jamon Iberico Bellota (Spanish ham from acorn eating pigs), patatas bravas... All just great. We have yet to pay over $4 for a bottle of wine. We are exploring all the inexpensive wines first before moving up. We have yet to be disappointed. Yesterday we bought our own Jamon. Some big and exciting news. My day job for the last six years was freelancing for Universal McCann in San Francisco in online media working on the Microsoft account (a media planner decides where to spend the client's advertising budget to reach the target audience). One of my campaigns (Microsoft Windows OneCare) was nominated for "Best use of Search" in the Festival of Media awards held in Valencia last month. Since I had moved to Madrid and my campaign was nominated, I went to the event. Well, my campaign won. It was like the academy awards, but a little geekier. 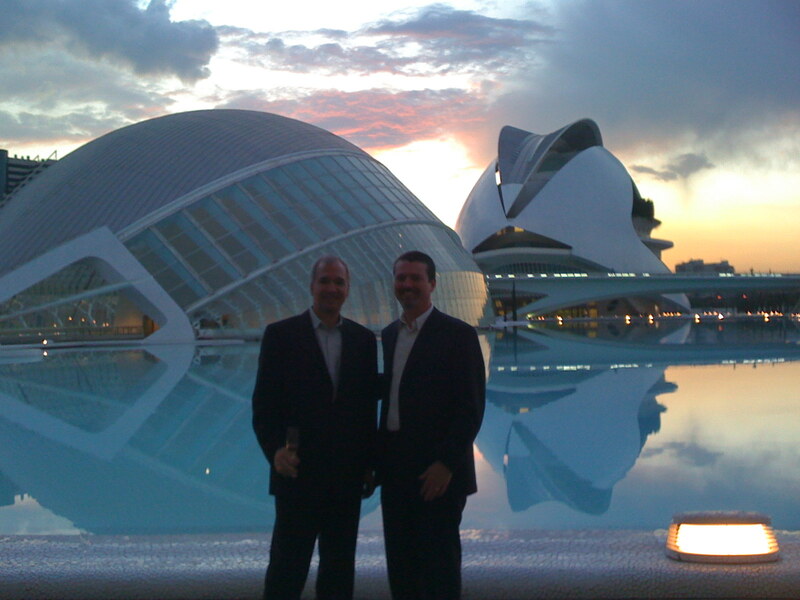 Here is a photo with Brian Monahan at the Palacio de Congresos in Valencia (Brian hired me back in 2002). 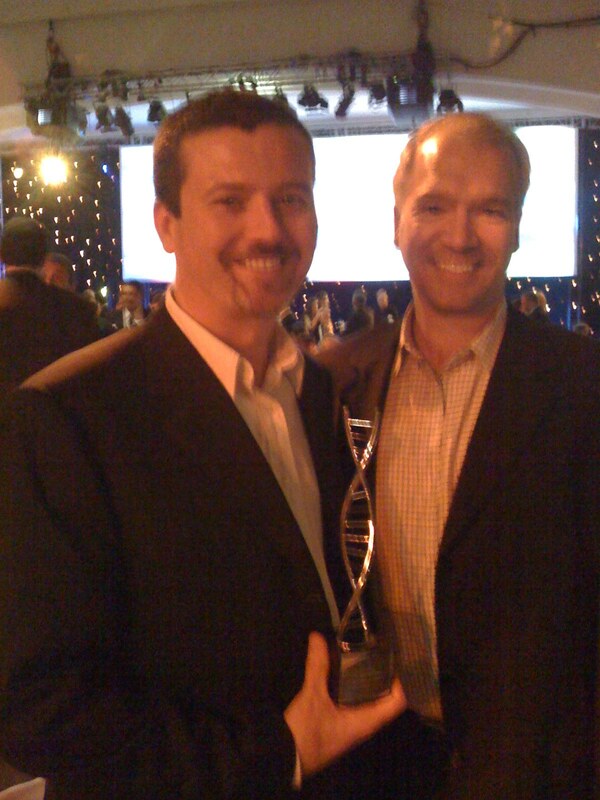 And another with the award. And if you want to see my 55 seconds of fame accepting the award, click the YouTube link here. And if you want to read about the search award campaign, click here for a .pdf document. Going forward starting this month, we will feature a few wine values from our sister publication WineBlueBook (a wine buying guide that compares wine ratings and price to determine value). Tres Sabores; 2008 Sonoma Mountain Farina Vineyard Sauvignon Blanc, 2007 ?Por que no? The 2006 Betz, Cabernet Sauvignon Columbia Valley Pere de Famille received an average score of 94 points and at $63 it is 29% of the average cost of a similar scoring West Coast Cabernet Sauvignon earning it a "Great Value" moniker. The 2005 Buoncristiani, Cabernet Sauvignon Napa Valley O.P.C. Proprietary Red Wine received an average score of 93 and at $40 it is 31% of the average $130 cost of a similar scoring West Coast Cabernet Sauvignon. At the value end, at $25, the 2007 Beringer, Chardonnay Napa Valley Private Reserve received an average score of 92 points and is 40% of the average $62 cost of a similar scoring West Coast Chardonnay. The 2006 Shoofly, Shiraz South Eastern Australia received an average score of 89 points and at $10 it is 34% of the average $29 cost of a similar scoring Australian Shiraz. A total of 460 wines are profiled in the May 2009 issue of WineBlueBook (a wine buying guide that compares wine ratings and price to determine value). Special thanks to the following sponsors of WineRelease.com: Viader Vineyards, DeSante Wines, Hestan Vineyards, O'Brien Family Vineyard, Raymond and Vie Winery. They help make WineRelease possible. � Copyright 2009 WineRelease.com. All rights reserved.